This Saturday morning, May 29, the city will be sponsoring a household electronics curbside pick-up service. 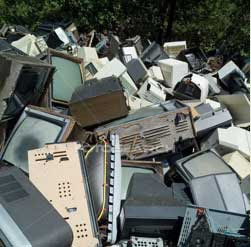 You may put any unwanted electronic devices in front of your home and visible to the street by 8:00 a.m. this Saturday. The devices will be collected and safely disposed of between 8: a.m. and noon. Alternatively, you can take unwanted electronic devices to the 1st Ward Streets and Sanitation Ward Yard at 2505 W. Grand Ave. The Commission on Chicago Landmarks will host a spring workshop next month for community organizations representing the city’s 53 designated Chicago Landmark districts. The Historic Preservation Division will host the event at our downtown office. The topics will be additions and new construction in historic districts and feature examples reviewed by the commission. The workshop will be held on Saturday, June 5, from 9 a.m. to about noon, at the Historic Preservation office, 33 N. LaSalle St., Suite 1600. Registration and light refreshments will be available beginning at 8:30 am. We plan to include a walking tour of some current downtown rehabilitation projects, including recent work at the Carson, Pirie, Scott & Co. building, in the final hour of the workshop. Ald. Joe Moreno continues his 1st Ward weekend open hours Saturday, May 29, at Strack & Van Til, 2627 N. Elston Ave.. Moreno and ward staff will be at the grocery from 11 a.m. until 1 p.m. The Do-Division festival includes a street fest: on Division Street between Damen and Leavitt, a family stage on Hoyne and a sidewalk sale spanning 10 Division Street blocks between Ashland and Leavitt. The $5 donation benefits the sponsoring West Town Chamber of Commerce, the Division Street Committee and four local elementary schools: A.N. Pritzker, LaSalle Magnet II, Anderson & De Diego. Music includes the bands Hood Internet, Yacht, Pelican and Ponys on the Damen Avenue stage, and Jason Isbell & the 400 Unit, Cory Chisel & the Wandering sons, the Night Marchers and the Good Life on the Leavitt Avenue stage. Family Fun Fest activities feature a bounce house and face painting, crafts and cookie decorating, silent auction, petting zoo, pony rides and science demonstrations. The schedule is available at do-divisionstreetfest.com.